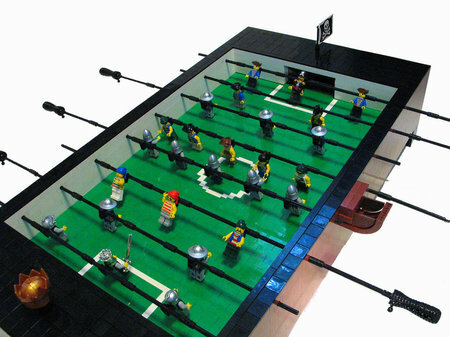 LEGO fans will love this, especially if they are also foosball fans. This dude Mt Dew Monkey was watching a cartoon Phineas and Ferb and it struck him to create something fun. The outcome is this LEGO Coffee Table Foosball Table. it is complete with custom minifigs and also an an authentic “faux” oak woodgrain finish. The creator says that there is still some minial work remaining like a little ‘tweeking as far as the push rods go’ and also a ‘tighter connection on the minifigs’. Looks amusing but no further detail has been shown on when, how much and all. I am not such a big fan of foosball but I like LEGO for that sakes this is pretty neat. And having friends over the weekend will mean having more to do than just gossip or have a movie marathon. And the coffee table part, I am not sure of. Maybe you can also use it as a coffee table when you aren’t playing, but that would be a little weird.